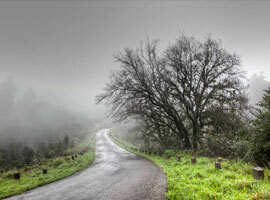 55 km north from Chikmagalur town is Kemmangundi, a scenic hill station on the Baba Budan Giri range of hills. Kemmangundi is also known as K.R. Hills after the Wodeyar King, Krishnaraja Wodeyar, who had made it his favourite summer camp. 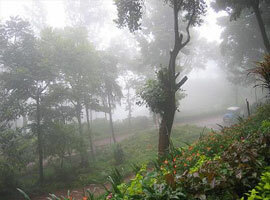 Kemmangundi, at a height of 1,434 meters, is surrounded by thick forests and a salubrious climate through out the year. 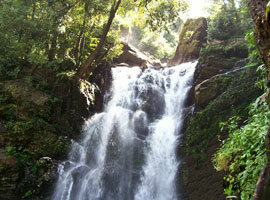 It is surrounded by the Baba Budan Giri range and blessed with silver cascades of mountain streams and lush vegetation. Its beautifully laid out ornamental gardens and enchanting mountain and valley views are a treat to the eye. Spectacular sunsets are a must see from various locations in the district, even from the Raj Bhavan. For the adventurous, Kemmangundi offers many peaks to scale and intricate jungle paths to explore. This place has a beautiful rose garden and other attractions. There is a place called Z-point at about 10 minutes walk from this main place which gives a nice arial view of the Shola grass lands of the Western Ghats. 95 km southwest of Chikmagalur town is Kudremukh range (in Kannada Kudure = horse and mukha = face), so named because of the unique shape of the Kudremukh peak. Overlooking the Arabian sea, the broad hills are chained to one another with deep valley & steep precipices. 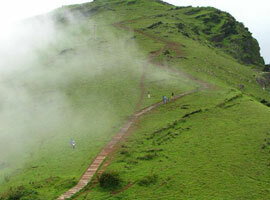 Situated at 1,894.3 meters above sea level, Kudremukh is rich in iron ore deposits. The Kudremukh Iron Ore Company conducts mining operations, benefaction and transportation of the ore as slurry through pipelines to the port at Panambur near Mangalore. Mullayanagiri is part of the Baba Budan Giri Hill Ranges here. It stands 1930 meters tall and is the tallest peak in Karnataka. Its height is famous mostly for watching sunsets from. 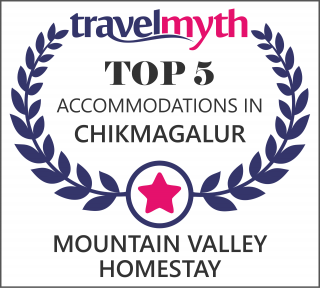 It is 16 km from Chikmagalur town. Driving to Mullayanagiri is worth taking a risk. On the way is Sitalayanagiri where the water in the Shiva temple neither increases nor decreases. The road to Mullayanagiri is very narrow with a views from steep cliffs. Driving to the peak is not possible and includes a trek up the hill from the half way point. There is a small temple on top of the hill. From the topmost point of the hill the Arabian sea is visible on clear days. 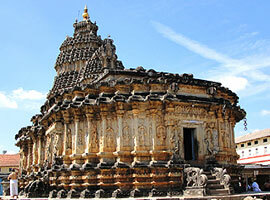 The small hillock in the temple compound is the highest point in Karnataka. The narrow road to the temple makes two way traffic immpossible. It is a great trekking spot in Karnataka. To the north of Chikmagalur town is the Baba Budan Giri Range or Chandra Drona Parvatha as it was known in the ancient times, which has one of the highest mountain peaks between the Himalayas and the Nilgiris. The peak takes its name from the Muslim saint, Baba Budan, who resided here more than 150 years ago. 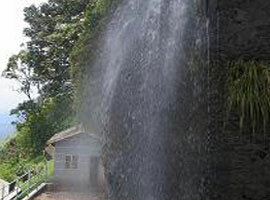 Hanumana Gundi Falls: Located 32 km. 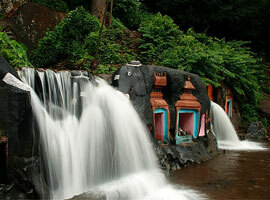 from the Kalasa, the waterfall has water falling on to Natural rock formations from a height of more than 100 feet. Occupying 495 km². 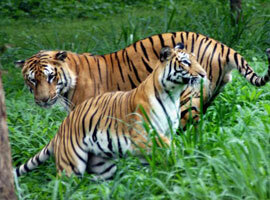 of wildlife sanctuary and Project tiger reserve, this region is an important watershed of the Tungabhadra river. The huge reservoir here is the main water supply to several districts in the rain shadow regions of south Karnataka. 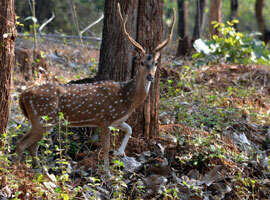 The forests here are rich in Bamboo and birds species unique to both the Malabar and Sahyadri ranges. Is the main temple in Belur and is only one at the three major Hoysala sites (the other two being Halebid and Somnathpur), that is still in daily use. 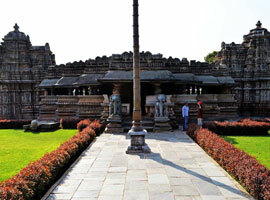 Begun in 1116 to commemorate Hoysala's victory over the Cholas at Talakad, it took a century to complete. 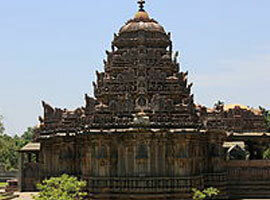 It is said that every major deity in the Hindu pantheon is represented on this temple. What is remarkable about this shrine is its compact structure, and perfect proportions. The wealth of sculptured friezes is simply unbelievable, since from the base to the projected eaves, every inch of available wall surface is covered with the most exquisitely sculptured images. On the inside of the temple, superb carving decorates the hand-lathe-turned pillars and bracket-figures on the ceiling. Each round filigreed pillar is different in details. Outside the temple, on the vimana, the Hoysala sculptors have surpassed themselves - unending rows of nearly 650 elephants, horses lions, birds and warriors. The larger panels of the wall sport scenes depicting the great epics - Ramayana and Mahabharata. 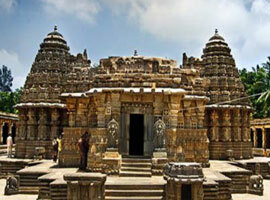 Located 17km east of Belur, was the ancient capital of the Hoysala Empire. Founded in the early 11th century as Dwarasamudram (Gateway to the seas), it was destroyed by the armies of the Delhi Sultanate in 1311 and 1327 AD, after which it was deserted and later renamed Halebid (Old Capital). The Hoysaleswara temple at Halebid, the largest of the Hoysala temples, was started in 1121 AD, about 10 years after the temple at Belur, but despite 86 years of labour, it was never completed. 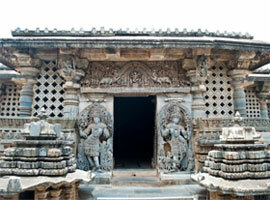 Nevertheless it is easily the most outstanding example of Hoysala art. Every centimeter of the outside walls and much of the insides are covered with an endless variety of Hindu deities, stylised birds and animals and friezes depicting the life and times of the Hoysala rulers. Halebid also has a few other temples - the Kedareswara, though a dilapidated shrine, has is a classic example of Indian temple architecture. There is also an enclosure containing three Jain bastis (temples), the main being the Parsvanath Temple, with its 32-pillared pavilion. The 14 feet high image of Parsvanath has a seven-hooded cobra over its head. 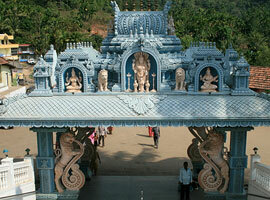 The two other shrines are those of Adinath and Shantinatha, though smaller, are elegant structures.